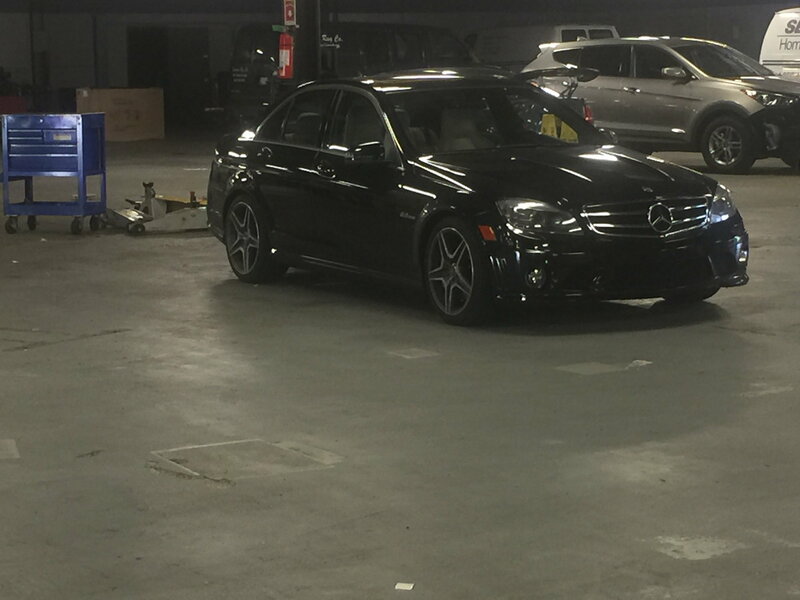 New C63 owner from NY here. 4th Mercedes however (had old school ones) and experienced mechanic and exotic car owner. Background is mech. eng. Welcome. Think you will love the C63. Welcome. Congrats on the new ride. Congrats and welcome!! Share that beauty and post some damn pics!! So far, I did a bit of maintenance, spark plugs, air filters, diff oil, some whiny idlers, alignment, oil change, am getting ready for the transmission fluid change. I may do a compression test and oil pressure measurement. The funky part about the compression test is that nowhere in the WIS does it say to pull the fuse on the fuel pump, but the Mercedes compression tester cranks as well as measures, so maybe when you pull the relay where the tester plugs in, this inactivates the fuel pump too. The other thing is that by cranking with the key in the ignition, I am not in charge of the duration of the cranking. So couple challenges with that. Welcome! You're gonna love the car! So is there a reason that you feel like need to do a compression test? It looks like a PFL car based on the pic, but are you having any symptoms of compression loss? I obviously bought the car used. The catastrophic one that causes several cylinders to have numbers that are much lower than all others. That has symptoms, as everyone knows. The slow loss of compression in time. This is uniform and many times the only thing is that you won't get all the power that you're supposed to get. Under my opinion, the higher the compression ratio, the more likely this is to happen. So I am wanting to establish a base line while the mileage is still on the low sideand am wanting to check the pressure number in the WIS (to see where on the wear curve I am starting my ownership), I think it's 160 PSI, but I have to go back and look again. Last edited by Vladds; 09-15-2016 at 07:16 AM. Be aware of the head bolts issue, my head gasket started leaking 4 months after I bought it. Yes. To the OP try to do a leak down test ASAP. At the oil change, the oil came out nice and no sign of milkshake. The temperature stays constant, no smoke, not even a blue puff at start up. The old spark plugs were not crystal clean. The oil level is not increasing unexpectedly and the antifreeze does not look oily or like carbonated soda. There is no miss, knock or pending code. I knew that this will have the old style bolts when I bought it, but the car is not having a headgasket episode due to broken bolts at this time. The compression test is something I do with all my cars when I first get them. Last edited by Vladds; 09-15-2016 at 09:00 PM. Weistec m275 v12 4 matic bs?